Preparing a great wedding day emergency kit (ahead of the wedding) can really help reduce your stress load when getting ready for your walk down the aisle. Not to mention, if you actually have to use it, it can save the day! You will definitely need one for yourself (as the bride), but consider putting emergency kits together for bridesmaids. You can even surprise the groom and his guys with emergency kits of their own. Phone Numbers (and cell phone numbers) for your wedding day vendors. If someone is late or doesn't show, you need to be able to get in touch with them without having to scramble for their contact information at the last minute. Bottled Water. This will be the most photographed day of your life. It's important to stay hydrated. Try to stay away from energy drinks loaded with caffeine. Straws. So you don't mess up your lipstick. Energy Bars. It's easy to forget to eat during the frenzy of the big day. Have some energy bars on hand for the entire wedding party. This can really help prevent fainting at the altar. Aspirin, or other pain reliever. No one wants to be stuck with a headache for a wedding. Cell phone charger. Start the day with the phone fully charged, but be sure to bring a charger with you too. Button up shirt. Put this on over your dress when applying or touching up makeup. Nail kit. This should include a file, clippers, nail polish, a nail file, and nail glue. Contact lens solution and re-wetting drops. Even if you don't wear contacts, there's good chance someone in your wedding party does. Small sewing kits. This should include thread in the color of your wedding dress, and your bridesmaid dresses. Be sure to include small and large safety pins, and sharp scissors. Moist Towlettes. You might even include a stain removing pen with them. Static Guard. Dryer sheets work too! Baby powder. This is for sensitive areas to help beat the heat. Breath Mints. Should this be #1 in the list? Cameras. You'll want to take candid shots while you are getting ready! The girls are usually good about this, but the guys ... not so much. You might through a few disposable cameras in their emergency kits, with instructions to put them to use. Shine Control Blotting Sheets. This will help keep the glare off your nose, forehead, and chin during photographs. Super Glue. Today is not the day to have a heel break and have no way to fix it. 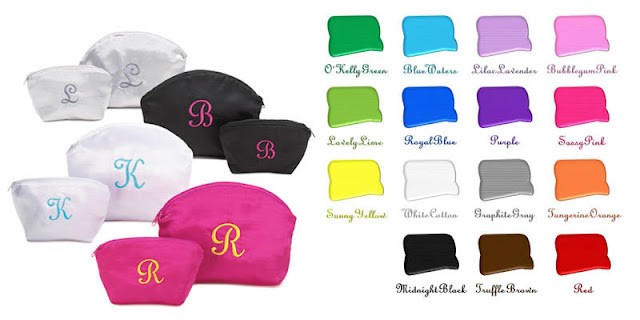 Pack all these items up in a cute personalized tote bags and they double as fantastic gifts for your bridesmaids. Are you planning wedding day emergency kits for yourself or your wedding party? Tell us what else you are including with yours! For a great selection personalized tote bags and wedding day emergency kit starter packs, visit us online at WhereBridesGo.com! Take 15% off your entire order at WhereBridesGo.com with coupon code WHATBRIDESLOVE, plus get FREE SHIPPING on orders over $100.